Withy Grove Safes & Office Interiors is a long established professional supplier & installer of Security safes, Fire Safes, Fire Cabinets and Safes for the Home, Office or Commercial premises. Established since 1850, we have been trusted for generations and are recognised by major Insurers and Insurance brokers. We are an 'all brands' supplier, leaving no stone unturned to ensure your needs are met in a timely and professional manner. All this at prices that are kind to the pocket. In addition to the supply and install on new safes, we always have large stock of pre-owned, refurbished safes in our main showroom. Further services include: Safes removals for storage or Disposal or Safes relocation, Safes repairs, including openings or key duplication. or even full safes refurbishment! 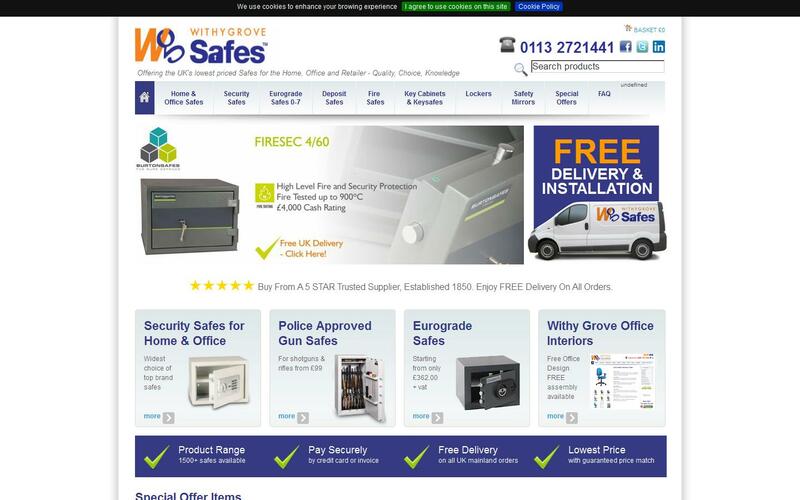 Our on-line web site, www.withygrovesafes.co.uk offers a comprehensive collection of top brands at the best sale prices with, FREE DELIVERY & POSITION or FREE INSTALLATION (where shown) or sold cheaper for self install. If you are an elder generation customer, our advisers will be happy to discuss your requirements in complete confidence if you prefer not to use the web site. Looking for Lockers, Key safes & Key cabinets, Safety Mirrors for business or home, then look no further! Withy Grove Safes & Office Interiors: est: 1850. As a safe manufacturer, Phoenix Safe Co Ltd have worked in partnership with Withy Grove Safes for many years. The team at Withy Grove Safes are very knowledgeable and helpful and are dedicated to providing up-to-date and comprehensive product information to their customers. I just want to thank Russ and everyone at Withygrove for there fantastic service.Customer service was nothing but exceptional and the fact they understood the Asian market and culture helped towards us getting the right product but also reassured we were dealing with the right people. They were very quick at getting back to me and are regarded as experts in there field.Look forward to using you again and will not use anyone else going forward!Thanks guys!! !